Puteri, never seen the 'fireplace' before? So hows Duncan nowadays? Duncan is fine. After that incident he used to fear anything that looked hot. He is 4 now and I think he has quite forgotten that incident. Whenever I tell him to get out of the kitchen because I have a hot pot on the stove or a hot oven going, he ignores my warning to leave the kitchen. 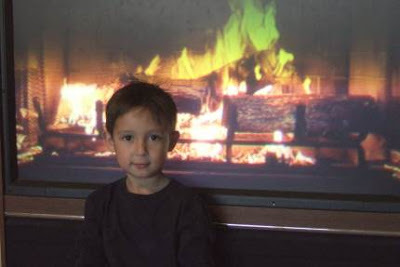 Maybe next time you'll get the chance to see a real fireplace? Ours is a gas fireplace with fake logs. In California we can't burn our log fireplace any time we want in the winter. If the air quality is bad that day, the burning of log fireplaces are banned for that day. That's pretty cool! Great idea. Kelly, thanks for dropping by. A cool idea indeed with young kids in the house! Cat, yes that is a cute picture for a Christmas card but Denice is not in that picture. I think I will take another one with both of them in front of that fireplace video! Did you know that that video is a sampling opp from PPP? Yes! kesian duncan...alu fobia.nasib iya nadai apa-apa...anyway,happy xmas ngagai nuan. Amat alu phobia meh iya kutai, tang diatu nye enda ingat agi iya! Nadai ninga ma kitai ngasoh pansut ari dapur!